Bayern found themselves as the weak and incompetent brother of TSV 1860 Munich – the Munich based team that was feared throughout Germany and across Europe. It would not be until a group baby faced teenagers stumbled into the Bayern Munich locker room only to emerge, four years later, as a dynasty. Among these youth players were Hans Georg Schwarzenbeck, Sepp Maier, and, of course, “Der Kaiser” – Franz Beckenbauer. In order to complete this squad of budding talent, they would need a striker. In 1964, a disheartened player who felt he would never break into 1860’s star-studded lineup took the bus across town to try his luck at Bayern Munich – then a mediocre second division team. His name was Gerd Muller. The man who would come to be known as “Der Bomber” led the young squad to promotion in his first season at the club, setting the stage for the dominance that lay ahead. In 1972, Muller would score an incredible 40 goals in a single season, a record that holds today. These goals contributed to his 365 goals in 427 appearances for Bayern Munich. If Gerd Muller was “der Bomber” the penalty box was his runway. 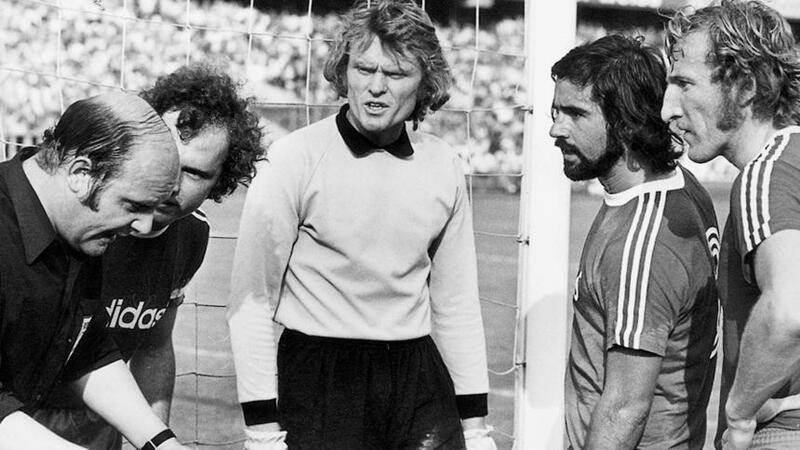 If Gerd Muller was the tip of Bayern’s spear, Hans Georg “Katsche” Schwarzenbeck was the lynchpin at the back. This unsung hero of European football remains a giant in the eyes of the club’s most loyal fans. An academy product, Schwarzenbeck led Bayern Munich’s defensive line from 1966 to 1982. His relentless spirit and technical dominance earned him one of the more badass nicknames in all of football: “The Kaiser’s Bodyguard.” Though he made his mark through physical marking and relentless tackles, his best moment came in the form of a last-minute strike in the closing minutes of the 1974 Champions Cup Final against Atletico Madrid. After a goalless 90 minutes, the game was sent to extra time. In the 114th minute, Schwarzenbeck leveled his opponent just outside of the Bayern box. Atletico Madrid legend, Luis Aragonés fired in the resulting free kick to put the Spanish side up 1-0. Determined to make up for his costly error, Schwarzenbeck found himself with the ball 25 meters from the goal. He decided to have a shot. His rocket strike into the bottom corner was so impressive that after the match ended in a 1-1 draw, he remarked: “Even Pele wouldn’t have scored that one.” Bayern Munich would end up as Champions of Europe after winning the replay 4-0. For all of Schwarzenbeck’s brilliance in defense, however, a man was still needed between the sticks. That man – that legend – was Sepp “die Katze” Maier. “The Cat from Anzig” defined the tradition of German goalkeeping dominance that would be followed by such legends as Oliver Kahn and Manuel Neuer. Maier made his debut for Bayern Munich in 1958. In the years that followed, Maier would develop a reputation as an iron horse and a quirky joker. Along with a staggering 422 appearances without missing a game, he is known for a far more impressive accomplishment: being among the first keepers to wear shorts. Don’t be fooled; however, Sepp Maier was so dominant in goal that he was named German player of the year in ’75, ’77, and ’78. The player that completed “The Axis” along with Maier and Muller, however, built a legacy that outweighed the rest. That man was, of course, Franz Beckenbauer – Der Kaiser. Born amongst the rubble of post-war Germany on September 11, 1945, Beckenbauer grew up playing for 1860 Munich’s youth team. After getting into a fight with a fellow squad member, Beckenbauer decided to take his talents to the struggling Bayern Munich. That fight, however petty and insignificant it may have seemed at the time, set in motion the most significant career in German football history. Beckenbauer boasts an impressive resume that includes three European Cups, four Bundesliga Titles, and two World Cups (one as a player and one as a manager). His most impressive achievement was, quite simply, revolutionizing the sport. A player who will go down in history as one of the greatest defenders and greatest midfielders of all time, Beckenbauer became known for his play as an “attacking sweeper.” Starting from deep in the Bayern defense, Beckenbauer would make long forceful runs into the opponents’ half. His confidence on the ball made him a commander of the pitch. He commanded the Bayern squad with the tact and control of a puppet master. His ability to read the opposition and shift momentum earned him a reputation as the “Kaiser” in charge of Bayern Munich and Germany. In 1968, the squad that had won two national cups and one cup winners cup found themselves under the heel of new manager Branko Zebec. The Yugoslavian brought discipline to the club on the pitch by refining their attack and reinforcing their defense. Off the field, he made no friends when he decided to institute club rules such as banning beer within the locker room. Zebec enjoyed a successful first season, winning the Bundesliga and the DFB-Pokal. Ultimately, Zebec’s stubborn nature led to a deterioration between his staff and players. Determined to evolve, the club sacked Zebec and brought in the Franz Beckenbauer endorsed Lattek as his replacement. Lattek coached the team to three consecutive league titles, a first in German football, and a league cup. 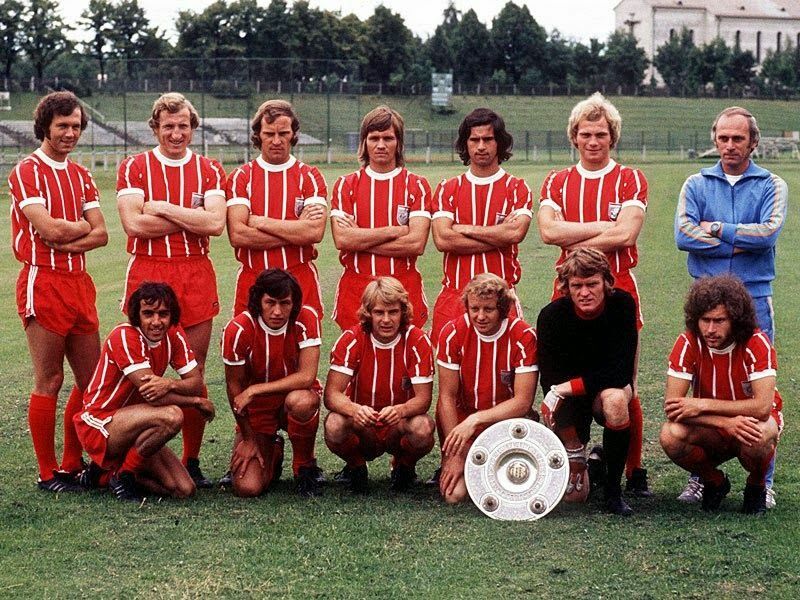 In 1974, Bayern Munich beat Atletico Madrid in the final of the European Champions Cup becoming the first German team ever to win the competition. The golden age of German football had arrived. When Udo Lattek left the club following a period of poor form domestically, Dettmar Cramer was brought in – once again on the recommendation of Franz Beckenbauer. Playing a 1-3-3-3 system that prioritized strong defending while maintaining the freedom for Beckenbauer to begin the attack, Bayern were invincible. Bayern Munich would complete a treble of European Championships, beating Leeds in 1975 and St. Ettiene in 1976. The Bayern Munich team that dominated Europe in the decade after 1967 established a path of evolution. The club transformed from second division settlers to the “Rekordmeisters” of today. This particular team is so significant as they created the base for one of the most developed and revered club cultures in the sport. In researching the players for this article, it became clear that being a member of Bayern Munich is a title that lasts for life. Gerd Muller has been a youth coach at the club since 1992, Sepp Maier can be found instructing goalkeeping prospects, and Uli Hoeneß is the club president. To establish such a connection with players, managers, and supporters, Bayern Munich prioritize culture where other clubs prioritize results. Since Bayern emerged in the late ‘60s, German football has been a force of destruction in world football. It was the bond between these German Galactico’s which formed the springboard for their dominance. Formed from a disciplined efficiency and ruthless practicality, German football has embraced a defined, consistent output rarely displayed by other nations. This Bayern Munich side were integral in condensing the German footballing experience and broadcasting it to the world. German football will always be feared and for that, the rest of the world has the Bayern side of the ‘60s and ‘70s to thank.